Happy Father's Day out there! I can't believe it's already the middle of June. Where does time go?!? Pointless Cafe compares royal blue nail polishes. Chalkboard Nails teaches us how to create a starfish manicure. Neverland Nail Blog shows us her nail art she created using a straw. The Nailasaurus shares with us her Sandy Sandwich nails mattified. Morie's Nail Art shows us her gold star nails. Enamel Girl shows us her tape manicure. Make-up/Music/Money/Me shares with us her nail care routine. Polish Obsession shares with us her purple jelly sandwich nails. A Little Polish shows us her manicure using GlitterFest Water Wings. Confessions of a Sarcastic Mom shares with us Snow White and the Huntsman polishes. Manicure Description: I am obsessed with dotting tools and creating different types of dot manicures. 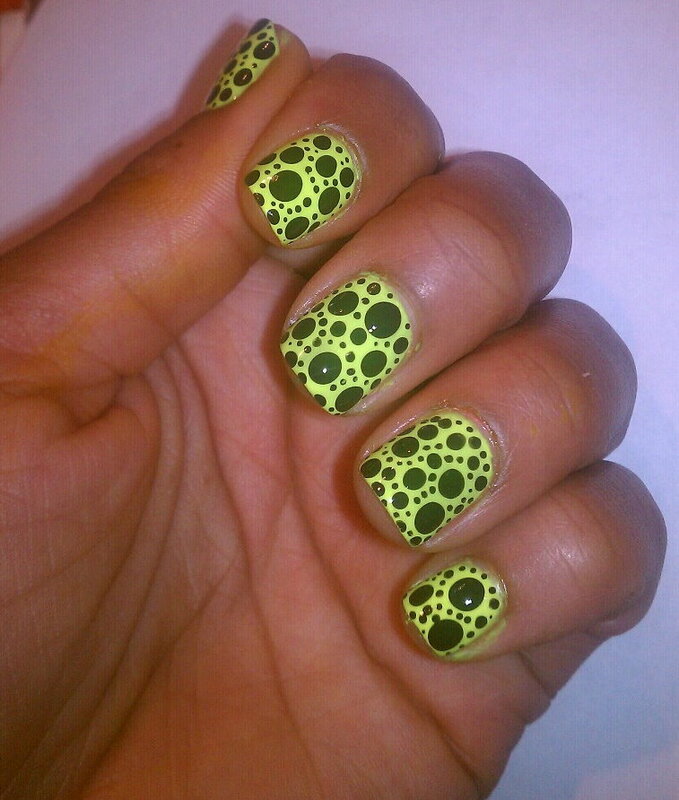 For this mani, I used Sinful Colors Neon Melon and black acrylic paint. I used the other end of a paintbrush, a bobby pin, and a toothpick for the different sized dots. Favorite Polishes: I love china glaze polishes and sinful colors. They have amazing colors, affordable and easy to find. 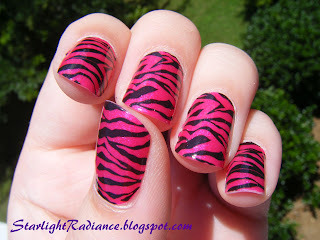 Manicure Description: This is actually Sally Hansen Salon Effects nail strips in Animal Instincts and I am loving the pink zebra pattern. (Am I cheating...?) I got these to review from Influenster and love them! Easy peasy lemon squeezey! I love Amanda's dot manicure! It reminds me of dinosaur eggs lol. Both of these manis are super cute! that dotted mani is sick!